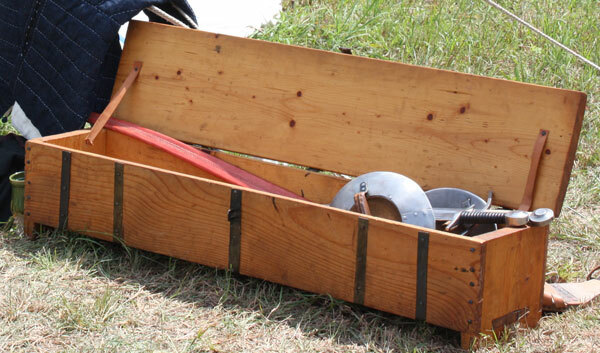 We have built and acquired a number of styles of chests and boxes to store and carry our gear. There are quite a few surviving chests and most of them represent the sort of chest that is too large to be mobile or is a finely finished piece that is works of art in itself. While the latter circumstance is a contributor to their survival, it does mean they represent truly high end items and not the sort suitable to a gentry household. We have also been looking to combine practicality (since we have to move these things to and from shows in our vehicles), a period design esthetic Otherwise why bother), a desire to represent ordinary (rather than princely) versions of these things, and period construction and decoration techniques(which should be the point of any reconstructed artifact). One major concession is that, so far, our chests have been built with sawn lumber rather than the riven lumber that was used in most of the orignials that we have examined. This is a long lived construction style that come sin to use by the thirteenth century and continues on until at least the sixteenth. Of course some details and the decorative choices change over that period. What gives it the “clamped front” name is the way the front (and back) is constructed, with a horizontal board (or boards) connected to a vertical stile on either end. This arrangement is usually a mortise and tenon arrangement fastened with wooden pins. 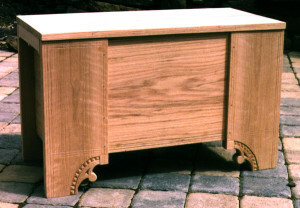 The chest to the right is built of oak. Its long stiles seem to have been common in domestic chests, despite many survivals having lost that length over the centuries. They are susceptible to damage when the chest gets moved and the end grain on the styles will soak up moisture from the ground. The lid on most chests of this type is attached to a batten on either end and those battens are integral parts of the hinge mechanism. The front end of the batten fits into a mortise on the front stile and the back into a slot on the back stile. 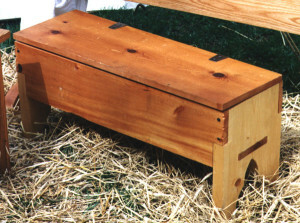 Note that the top of the back stile and the back end of the batten are often rounded to allow free rotation to the lid. A wooden hinge pin passes from the outer edge of the back stile, through the batten where its sits in its mortise, and enters again into the stile. Medieval survivals often have an iron plate set over the spot where the wooden hinge pin enters the stile, presumably as an effort to thwart anyone trying to pry or drill out the hinge pin and thus enter the chest while circumventing the lock. This feature is often broken in surviving chests and such specimens have metal hinges added to them. Like chest 1, these two have an inside feature called a till, a built-in box for the storage of small items. The front and bottom of the till are thin boards set into mortisses in the stiles. The chest’s carcass makes up the ends and back of the till. Chest 2 (to the left) has a very simplified end with just the hinge batten. It is a less common variant than the more elaborate framing on the one above. Chest 3 (to the right) is one of our early chests (yes, we know the stiles are too thin) showing another form of framing. When the lid is closed, the hinge batten appears to be part of the framing. Chest 3 has had its size determined by the vehicle in which it needs to travel and (to some degree) by the availability of suitably sized boards. It , but is approximately 75-80% the size of the chest we took as a model for its construction. Note the carving on the front stiles. The design is taken from a surviving chest, but the pattern is incomplete, indicating that the original once had longer legs. We went with copying it as it now is because shorter legs are easier for us to transport. Chests that were expected to spend their lives up against something (most of them) don’t seem to have had their backs decorated. Here is another variation, this one a “cheaper” version. Rather than the more time consuming mortise-and-tenon joints, this one uses half-lap joints on the clamped front. Similarly, the end panels are inset in a rebate on the stiles and pinned in place. It still uses a batten as the hinge, but the batten resides inside the chest. The “six-board” chest is so called because it uses six boards in its construction. Each end, each side the top and the bottom are single boards. Such chests use metal hinges. The one to the left has shirt strap hinges but some survivals use what we modernly call a “snipe” hinge which relies on interlocking rings for the mechanism, said rings are set either on straps or simply end in spikes that get driven onto the wood and clenched over. Chest 5 (on the right) has the front and back pieces partly overlapping the end stiles and held in place with nails. The bottom has tenons on either end that you can see because they are set in a through mortisse. it is built of pine. white woods such as pine are likely candidates for the materials for cheap chests; they probably understand back then what we do now: that such woods do not surviving the years as well as oak and would thus be worth less. They are, however, lighter, a consideration in portable containers. 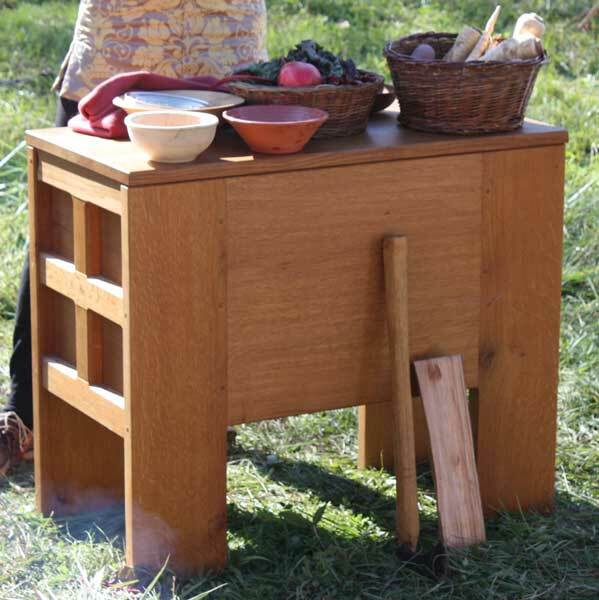 This one serves to hold iron utensils and tools associated with the camp kitchen. The long sides of Chest 6 (to the left) completely overlap onto the stiles and rest on the bottom part of these stiles. It has nails fastening the two together, but it also relies on metal bands to bind it. The bands also incorporate hinges and the central one ends in a hasp to fit over the staple on the front. Said staple accepts a padlock. This chest is also pine, as it represents a box that is as much crate as chest. It serves as a low grade sword chest. Chest 7 (to the right) is also pine but has been painted to hide that fact. 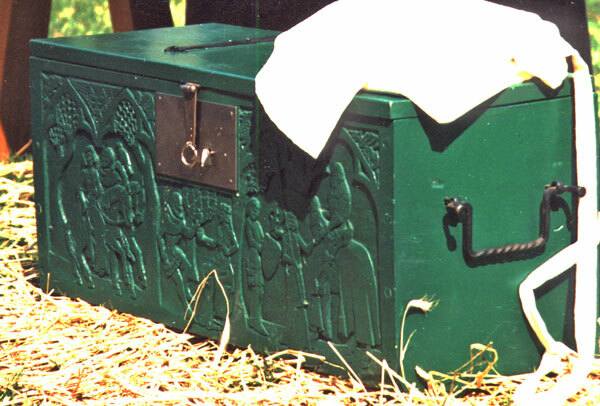 It has a carved front and metal fittings, including iron hinges and handles as well as a panel lock. The carvings are divided into three panels and each utilizes a motif from 14th century decorated pieces. The images were “updated” so that the depicted clothing and armor better suited being “new” in the late 14th century. Its construction is similar to the ones above, though the mortises for the bottom do not go all the way through the sides, and the construction uses wooden pins rather than nails, the better to conceal them under the paint. Though made of cheaper materials, the more decorative finishing raises its social level. The chest can be found in the halle tent serving the needs of the ladies who hang out there. Chest 8 represents a more upscale sword chest. It is made of pine (mostly to cut the weight in transport) and painted to conceal that It has four strap hinges and a separate hasp to engage the panel lock. It features a till on one end and a shelf beneath the till, an arrangement found in some medieval chests from Germany. 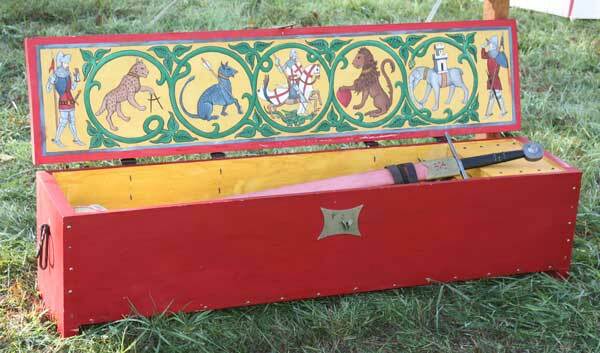 It is an arrangement that has proven useful in allowing more swords to be conveniently stored inside by setting the pommels and grips on the shelf so that the crosses can sit vertically and not interact with each other to complicate the packing. 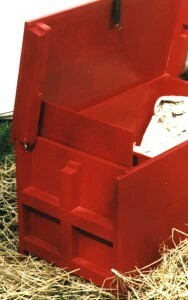 The outside of the chest is plain red, but the inside of the chest has a decorate ve scheme. A surviving chest lid in Glasgow also has a decorated inside. We didn’t copy that design, but chose to use the symbolic beasts from Fiore die Liberi’s treatise on the art of arms. Said beasts represent the virtues a swordsman needs. St. George, patron of soldiers, appears in the central rondel and two soldiers flank the design. Their poses come from a mid-fourteenth century English tomb brass but their costume has been updated to be suitable for the end of the fourteenth century.